BEIJING, March 5 (Xinhua) -- China's national legislature convened its annual session Monday, announcing actions that will shape efforts in the years to come to make China a great modern socialist country. That vision and a two-step approach were raised at the 19th National Congress of the Communist Party of China (CPC) last October: for socialist modernization to be basically completed by 2035, and to become a great modern socialist country by the middle of the century. Monday's opening of the National People's Congress (NPC) session marks a key national assembly after the Party congress. Observers say it will lay a solid foundation to turn the Party's blueprint into action in a "issue by issue, year in and year out" fashion. Before nearly 3,000 NPC deputies gathering at the Great Hall of the People, Premier Li Keqiang delivered the government work report. He called on the people to rally even closer around the Party Central Committee with Comrade Xi Jinping at the core, be enterprising and work hard. "Let us make new contributions to make these goals a reality," he said. The premier struck a confident note as he went over "historic achievements" made in the past five years, despite an "extremely complex" environment both at home and abroad. China's gross domestic product (GDP) rose from 54 trillion yuan to 82.7 trillion yuan; more than 68 million people were lifted out of poverty; 66 million new urban jobs were added. And the country is leading the world in high-speed rail, e-commerce, mobile payment and the sharing economy. According to the work report, the central government set the GDP growth target at around 6.5 percent for 2018. The target is the same as last year, but might deliver different growth as China makes it clear to prioritize quality over speed. "We will strongly promote high-quality development," Premier Li said. 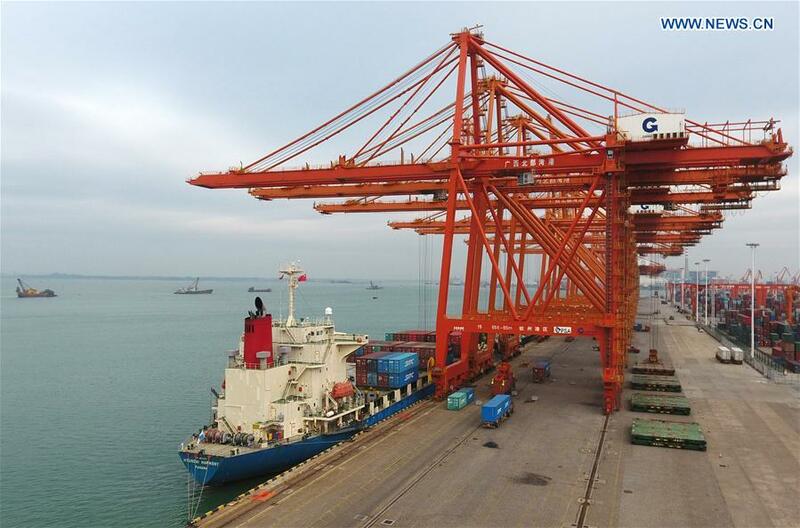 Observers have said that although continuous breakneck growth is now history, China will continue its role as the global economy's stabilizer as growth quality improves and the market further opens up. In manufacturing, China's traditional sector of strength, for example, the government will launch an initiative to shore up weaknesses in major equipment manufacturing and promote the development of integrated circuits, 5G mobile communications, aircraft engines and new energy vehicles. China is seen having an edge in artificial intelligence (AI), which may shift the landscape of manufacturing of tomorrow. Robin Li, the founder of search engine Baidu, is a leader in the AI sector. The company is spending heavily on autonomous driving systems. "I meet strangers who stop me on the street and ask when the self-driving cars can be on the road because they don't want to learn driving," said Li. "AI makes our life easier." Baidu and its partners gained a good start thanks to China's favorable business climate. If industry leaders embrace cooperation and open market, the sector would get a further shot in the arm, the Internet tycoon said. On Monday, the market is assured with a promise of tax cuts. Premier Li expects the sum of reduced taxes on businesses and individuals in 2018 to amount to 800 billion yuan. Great numbers of small low-profit businesses will see their income tax halved, and the ceilings on deductible business purchases of instruments and equipment will be significantly raised, he said. In fact, tax cuts have been a consistent policy over the years. A total of 918.6 billion yuan was saved last year as the reform to replace business tax with value-added tax (VAT) was carried out. Considered the biggest tax overhaul in decades, VAT is replacing the business tax, streamlining procedure and avoiding repetitive taxation. Li stressed increasing support for the "three critical battles" against risk, poverty and pollution. A moderately prosperous society cannot arise with volatile financial markets, people locked in poverty, or polluted skies, mountains and rivers. The work to address these challenges have been called the "three critical battles" by the Party authority. Among the targets announced Monday, the government aims to reduce the rural poverty population by over 10 million, reduce air pollutants in key areas, while working to forestall and defuse local government debt risk. Xu Rui, an NPC deputy from Ruijin, Jiangxi Province, said that his city, a revolutionary base, had entered a crucial period to eliminating extreme poverty. In villages after villages, people walked out of poverty as they were helped to grow better fruits, vegetables and tea, to reinvent their home-towns into tourist sites, or simply move to much more hospitable regions. Zuo Xiangyun, another NPC deputy from Jiangxi, said his fellow villagers were among those who benefited. "Tourists to my village increased from 100,000 in 2016 to nearly 220,000 last year," Zuo said. "As more tourists come, so do our income." This year also marks the 40th anniversary of the country's reform and opening-up policy, which injected vitality into the economy, sustaining it for four decades of steady, rapid growth. Premier Li said China would be bolder in reform and opening up, calling it a "game-changing" move in making China what it is today. He went on to say the government would better protect intellectual property and open wider to foreign investors, from the general manufacturing sector to telecommunications, medical services, education, elderly care and new energy vehicles. The market opens wider as the country's middle-income group -- numbering around 400 million -- grow the appetite for high-quality imported goods. To meet that demand, Li said, China will host the first China International Import Expo this year and lower import tariffs on products ranging from automobiles to daily consumer goods. The premier said setting ambitious goals but taking little action would not be tolerated. He said solid new achievements could be made "only by doing," and the future would be shaped by good solid work. In his speech, he repeated the call for the people to "do the work." "We must give our work everything we've got," the premier said. "The people's government does not let the people down." NPC deputy Zhang Xiong, a professor at Tongji University, said the work report sent a strong message that China is firm and confident marching toward the goal of a great modern socialist country. On Monday, the national legislature started deliberating a draft amendment to China's Constitution, the first such move in 14 years. Xi Jinping Thought on Socialism with Chinese Characteristics for a New Era is expected to be enshrined in the fundamental law. Mo Jiangping, a law professor with Southwest University of Political Science and Law, said China was at a critical stage to realizing the Chinese Dream of national rejuvenation and the constitutional revision would ensure better legal guarantees. The national legislature will deliberate an institutional reform plan of the State Council. Also to be deliberated is the draft supervision law, which, upon adoption, will give rise to a nationwide anti-corruption network consisting of supervisory commissions at the national, provincial, city and county levels to supervise all who exercise public power. "This session is a watershed," said Zheng Changzhong, a political science professor at Fudan University. "Plans are now being made at state organs to work toward the goal set by the Party." "We should do our jobs well as deputies, mobilize the public, implement the spirit of the Party congress and turn the wonderful vision into reality," said Li Shufu, an NPC deputy and chairman of Chinese auto company Geely, which became the largest single shareholder of German carmaker Daimler AG in February.